On Wednesday 5th December, Macquarie University is hosting a free autism research day. 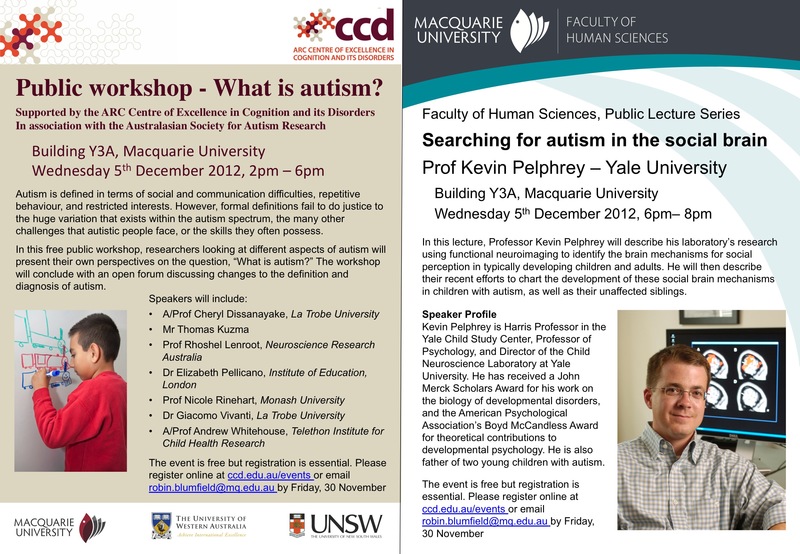 From 2pm until 6pm will be a workshop featuring short presentations from researchers from around Australia on the topic of “What is Autism?” The workshop will also feature a presentation from a young man with Asperger syndrome, and an open discussion of forthcoming changes to autism diagnostic criteria. Then from 6pm, there will be a public lecture from Prof Kevin Pelphrey of Yale University entitled “Searching for autism in the social brain”. Although the events are free, registration is essential. For details and registration, please follow this link. How do autistic kids’ brains make sense of sounds?